You and your pet are always on the go! 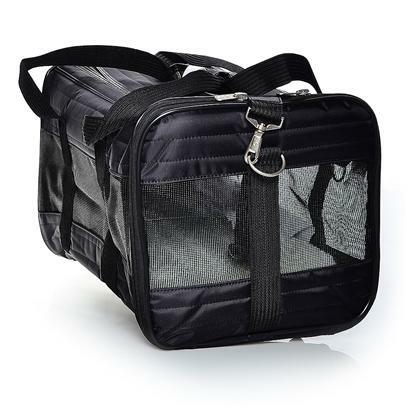 Keep your pet safe and comfy with the Sherpa Original Deluxe Bag. Made from durable quilted nylon that include mesh panels for ventilation and air flow, your dog or cat won't want to get out. The bag also features front and top entry and a washable faux lambskin liner. The seatbelt safety strap fits conveniently over upright luggage handle and the bag fits under most airline seats. If that wasn't enough, the bag also has two convenient zippered pockets, and adjustable shoulder strap, and an inside leash ring. Follow the instructions on the packaging to ensure proper use.